from NYTimes.com: An old stucco house stands atop a grassy hill overlooking the Long Island Sound. Less than a mile down the road, the renowned Cold Spring Harbor Laboratory bustles with more than 600 researchers and technicians, regularly producing breakthroughs in genetics, cancer and neuroscience. But that old house, now a private residence on the outskirts of town, once held a facility whose very name evokes dark memories: the Eugenics Record Office. 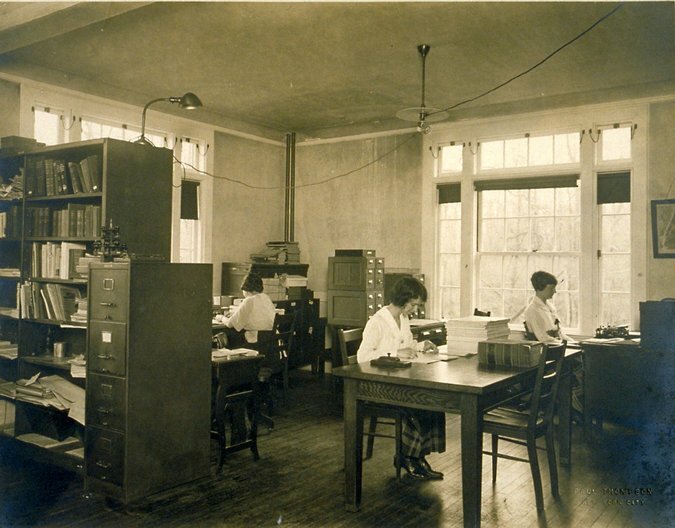 In its heyday, the office was the premier scientific enterprise at Cold Spring Harbor. There, bigoted scientists applied rudimentary genetics to singling out supposedly superior races and degrading minorities. By the mid-1920s, the office had become the center of the eugenics movement in America. Today, all that remains of it are files and photographs — reams of discredited research that once shaped anti-immigration laws, spurred forced-sterilization campaigns and barred refugees from entering Ellis Island. Now, historians and artists at New York University are bringing the eugenics office back into the public eye. “Haunted Files: The Eugenics Record Office,” a new exhibit at the university’s Asian/Pacific/American Institute, transports visitors to 1924, the height of the eugenics movement in the United States. Inside a dimly lit room, the sounds of an old typewriter click and clack, a teakettle whistles and papers shuffle. The office’s original file cabinets loom over reproduced desks and period knickknacks. Creaky cabinets slide open, and visitors are encouraged to thumb through copies of pseudoscientific papers. When the Eugenics Record Office opened its doors in 1910, the founding scientists were considered progressives, intent on applying classic genetics to breeding better citizens. Funding poured in from the Rockefeller family and the Carnegie Institution. Charles Davenport, a prolific Harvard biologist, and his colleague, Harry H. Laughlin, led the charge. Researchers sought out “unfit” families in the Manhattan slums and the Pine Barrens of New Jersey. They cataloged disabilities and undesirable traits, scribbling the exact dimensions of heads and arms. Psychiatric institutes sent crates of case files to the office, where the chief characteristics of “the feebleminded” were collated into pedigree charts. Davenport himself devised a sophisticated apparatus to quantify skin color. By the 1920s, the office had begun to influence the United States government. Laughlin testified before Congress, advocating forced sterilization and anti-immigration laws. Congress complied. The Immigration Act of 1924 effectively barred Eastern Europeans, Jews, Arabs and East Asians from entering the country. And, at the state level, thousands of people who were deemed unfit were sterilized. The University of Heidelberg in Nazi Germany later awarded Laughlin an honorary degree for his work in the “science of racial cleansing.” He accepted the award, and his research on Long Island continued to influence Nazi ideology throughout World War II and the Holocaust. When war broke out in Europe, widespread discomfort with eugenics and Nazism turned public sentiment against the office. In the late 1930s, an independent review by the Carnegie Institution found the office unfit to conduct human scientific research, citing biases and heavy reliance on anecdotal evidence, and it was closed in 1939. “The Eugenics Record Office was flawed in terms of methodology, taking hearsay evidence, and in terms of bias, accepting evidence that resonated with social prejudices,” said Daniel Kevles, a science historian at Yale University who is not involved in the N.Y.U. exhibit. As Cold Spring Harbor Laboratory turned its genetic focus to breeding better plants and animals, the eugenics office was all but forgotten — until David Micklos, executive director of the laboratory’s DNA Learning Center, applied for a government grant to scan files from the office and display them in an online archive, which opened in 2000. “It was a hidden part of American scientific history — people didn’t like to talk about it,” said Mr. Micklos, who added that he was inspired by ethical concerns surrounding the Human Genome Project. The Eugenics Archive, which offers period photographs and facsimiles of the original case files, is now open to the public on the Cold Spring Harbor website. The curators at N.Y.U. relied heavily on Mr. Micklos’s online archive as they began to reconstruct the Eugenics Record Office last year. In their research, they followed one lead all the way to a garage in Bar Harbor, Me., where they found a cache of previously undiscovered eugenics files inside original file cabinets from the office. The cabinets are on display as part of the exhibit. “Very few physical objects remain from the eugenics era,” Mr. Fuller said. “These file cabinets are an important physical link.” Visiting the exhibit last month, Mr. Micklos sat in a wooden chair and thumbed through a few of the files. “This is pretty much exactly what it would’ve looked like,” he said. At the N.Y.U. exhibit, the ethical line between genetics and eugenics is blurred in every cabinet; legitimate science and blatant racism vie for space on every page. The reconstructed eugenics office can force viewers to think about the ethical implications of today’s genetic research. But Mr. Micklos points out that the bigotry that gave rise to eugenics was never really about the science. “It doesn’t take any fancy scientific theory for people to hate one another,” he said.